George Graham reviews Jenna and the Charmers' "Everyone I Love Is Here"
The jazzy, often sultry vocal style by women singers who are usually called a chanetuse, has been enjoying a kind of continuing low level success in a world of electronically driven commercial pop. We have featured quite a few such vocalists in this album review series, most recently Cheryl Deseree. They usually are billed as solo artists, rather than part of a band, and often record with changing casts of studio musicians.. This week we have a band that revolves around a chanteuse, with a constant personnel, who are also very much integral to the sound. 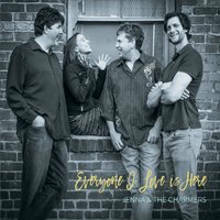 The band is Jenna and the Charmers, and their new recording, their debut, is called Everyone I Love Is Here. Jenna and the Charmers are from the San Francisco area, with Jenna being Jenna Mammina, who has been on the Bay area music scene in various capacities over the years. The other co-founder of the band is drummer Jeremy Steinkoler. Mammina and Steinkoler decided to get together to play some jazz and pop standards that they both liked but had not had a chance to perform otherwise. They recruited guitarist Steve Bissinger and bassist Ryan Lucas to form the sparse-sounding quartet. Their sound has as much in common with jazz as it does with rock and pop. Bissinger often plays in a jazz style, and his sound is more that of a jazz guitarist than a rocker, and Lukas often plays acoustic bass. Like many such jazz groups and vocalists, their stock in trade is interesting interpretations of existing music. But rather than drawing from the jazz repertoire, Jenna and the Charmers perform mostly rock and pop tunes from the 1980s or later, including music by Oasis, the Finn Brothers, Shawn Colvin, Sting, and more recently, a couple of songs by John Mayer. They also go back the Beatles and Joni Mitchell, with one song from the Tin Pan Alley era, and they include one original piece. The band’s name is actually fairly accurate. They do have a considerable degree of charm, with Ms. Mammina’s vocals being thoroughly appealing, and the band sounding generally laid back throughout. They try rocking out on a couple of tunes, but that proves not to be their strength. They are quite good at their sound, keeping a fairly uniform sonic and arrangement approach, but in a way that makes it interesting and engaging for the material they choose. Everyone I Love Is Here, the new debut album by the Bay Area group Jenna and the Charmers, is a quite appealing chanteuse style record. With the exception of one original song, it’s a set of creative covers of compositions from various diverse sources, from Tin Pan Alley through the Beatles to John Mayer. The intimate instrumentation can evoke jazz, and they rarely use overdubbing, so it’s mainly the one guitar with bass and drums. Jenna Mammina’s pleasing vocals are as light and as folky as they are jazzy. Our grade for sound quality is an “A-minus” with the recording being generally clean with Ms. Mammina’s vocals sounding warm and unfettered by studio effects. The dynamic range, something I tend to obsess about, how well the recording maintains the differences between loud and soft, is a little better than the contemporary average but is nothing to write home about. Music like this does not need to be jacked up to be loud all the time. While a record in this mode, consisting mostly of covers, does not really break new ground artistically, the overall result of the intelligent arrangements, and Jenna Mammina’s attractive vocals, does make for a thoroughly worthwhile recording.